Regularly, Tamilnadu State Level Eligibility Test Notifications are released on July / August and the SLET exams will be conducted in the month of October by Bharathiar University. 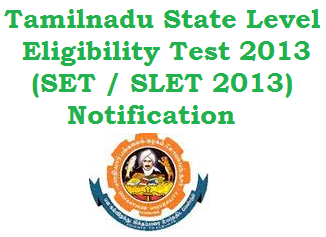 SLET 2013 Online Application form will be available after issue of SLET 2013 Notification on http://www.b-u.ac.in. 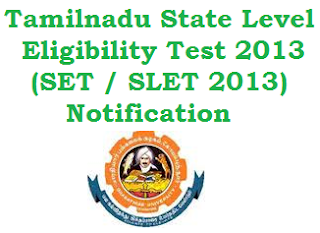 Candidates should register for Tamil Nadu SLET Exam 2013 using register id and password. After completion of tamilnadu slet 2013 application form candidates can able to Download and print copy of filled Application Form, Attendance Slip and Hall Ticket. Paper I: This is compulsory for all and is meant to test research / teaching aptitude of the candidate. Paper II : Paper II will be of 1 1/4 hours duration. This paper will be for 100 Marks containing 50 objective type compulsory questions. Each question will cary 2 marks. Paper III : Paper III will be of 2 1/2 Hours duration for 150 marks and it will consist of 75 objective type compulsory questions. Each question will carry 2 Marks.